The "good old days" is an expression that I hear a lot. I collect old photos of Phoenix, and share them on a Facebook page, and one of the most common comments I see is when someone is remembering the good old days, when life wasn't so complicated, and Phoenix was a better place to live. And it can be any era, it just depends on the individual. I like to time-travel in my imagination to these times, so today I'm going to go back to the 2000s in Phoenix. The good old days! Come along with me. Let's start at my favorite golf course in Phoenix, Cave Creek. I haven't played there for a while, but it's where I would always go. It's a big municipal course, and it's much less expensive than most other golf courses, and it's big and wide. I could always hit 'em far, but just not very accurately, and I like big, wide golf courses. The Cave Creek Golf Course built on top of a landfill, and I've been playing it, like, forever. When I first started playing it, the ground was still settling, and chunks of the course would collapse, or even fall into the creek. Well, the wash. The course follows the Cave Creek Wash, which most people don't even know is there. I know it's there because I've hit so many balls into it. Look for the orange ones. My friends and I would call it "Rattle Snake Gulch", and I liked the fact that there was rarely any water in it, and if you didn't mind getting your clubs all scratched up, you could hit out of it. For me, the 2000s was the era of the Barrett-Jackson auctions in Scottsdale, which I went to every year. I have friends from California who would come out and stay with me and invite me along when they sold their cars. I got to go to the big party for Carroll Shelby's 80th birthday in 2003. After the 2000s my friends didn't go to the Barrett-Jackson so much, but instead to the RM, and more upscale auctions. Yes, the Barrett-Jackson isn't really all that upscale compared to the ones that get less publicity. In 2004 I went to the party for the 100th Anniversary of Rolls-Royce, which was at the Arizona Biltmore. September of 2001 is the year I started teaching at Glendale Community College. And I'll never forget September 11th, 2001. And what I remember most is the eerie quiet afterwards because there were no planes in the sky, no distant thunder from the jets at Luke Air Force Base. 2003 is the year that I got my first cell phone. I've always had a tendency to wander off, and go looking at stuff, and when I went shopping with my girlfriend she would be annoyed at always having to go find me, because apparently I'm a three-year-old. So she insisted that I get a cell phone, which became my "leash". I still use it a lot like that - when I'm out history adventuring I'm sure to always be listening for my phone. Nowadays you can check Facebook on your phone, you couldn't back then. Well, not on the phone I had. The good old days are whenever you say they are. When you look back on them, I suggest that you do the same thing that I did after I played a round of golf - focus on the good things. I would always remember my best shots, a long putt, a lucky bounce off a tree onto a green (that actually happened once at Cave Creek - on the back nine!). I think it puzzled people who had seen how poorly I had played, but it's just the way I look at the world. There are so many wonderful things to remember, back in the good old days! Image at the top of the post. 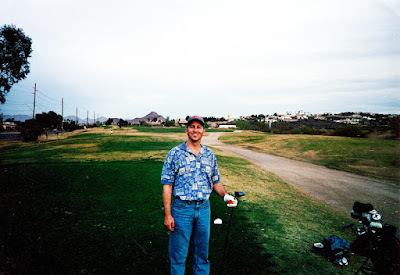 At my favorite golf course in 2000, Cave Creek, which is between Greenway and Thunderbird Roads at 19th Avenue.